As a pioneer and advocate of Eco-tourism, Tisa’s Barefoot Bar practices lowimpact operation to discourage further damage to living things. Over time we inspired others by our example and practiced what we preached. Our vision and mission to live in harmony with nature has been improved by lessons learned, along with new technology.Restoring and sharing our traditional practice and knowledge in organic farming and sustainable fishing has inspired new interest in local farming and an increased a variety of new food items grown locally for our community. We look forward to educating our visitors to travel responsibly. Stay in our Ecolodge tree house accommodations. They were designed and built for beach lovers who would not have it any other way. 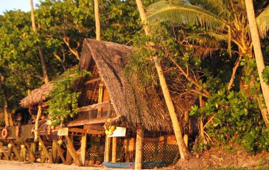 Hiking, snorkeling and Samoan Feast Tours are fun eco-friendly activities offered year round at Tisa’s.